The Ramphal building was constructed. The University held its first winter Degree Ceremony. The UK Indoor Climbing Championship was hosted at Warwick’s new indoor climbing facility which was renamed ‘The Bear Rock Indoor Climbing Centre’. Nelson Mandela was awarded an Honorary Degree at a special ceremony at Buckingham Palace. He was awarded an honorary Doctor of Laws by the Chancellor, Sir Shridath Ramphal. Mr. Jolly from the BBC Television show Playdays visited the University Crèche. “Playdays 96 – A Puzzle for Mr Jolly” was performed in the Arts Centre in June. Netting took place at Tocil Lake so as to remove 135kg or 11,000 young roach in order to restock a reservoir at Snittersfield. The second phase of the Claycroft residences opened, providing 312 rooms for postgraduates. 200 new Pentium-based workstations were up and running in four rooms on the ground floor of the central campus Library. This new computer ‘cluster’ meant that there were now 1000 workstations for students to use on campus. Callum Innes is one of Britain's leading abstract painters and this work is one of his 'exposed paintings' series. Exposed Painting Zinc Yellow is divided horizontally and vertically into different areas. 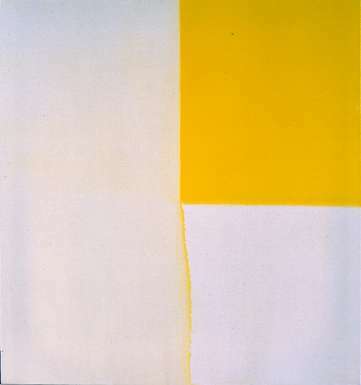 The artist has left one area of the canvas exposed and covered another in a flat, even layer of bright yellow paint. In the rest of the canvas, Innes has applied the same pigment and then removed it from the surface whilst still wet, washing it away with turpentine to leave ghostly vestiges of the original colour (he describes this process as 'unpainting'). This creates a sensitive image, with subtle contrasts of colour and paint surface. Callum Innes' work method is a balance between control and the unpredictable results of removing paint from the canvas, his approach could be called 'deliberately accidental'. Ebay started the online auction and shopping website, where people buy and sell goods and services worldwide.